I've just been taking a look through Ian Winstanley's website and find it very interesting. However, I didn't notice any details on there regarding the Nine Locks Colliery disaster in Brierley Hill, Staffs in 1869 in which my g.g.grandfather, Thomas Hunt, was involved. I do have all the details if you are interested in adding them to your site. I was reading your interesting article on the Nine Locks, however, page 3 is missing – the page 2 content is repeated in its place. Thanks Dave, I think it is sorted now. Thirteen miners—including men and boys—were trapped underground for a week following a flood. As the days passed, the group huddled together for warmth. Some got so hungry they ate the candles they had with them, leaving them all in darkness. Following this some even ate the leather from their straps and shoes, and pieces of coal. A full-scale rescue effort was undertaken above ground. As the mine was owned by the Earl of Dudley, the equipment was good for the day—it had a pump that lifted 250 gallons with each stroke and a tank that drew 2½ tons of water every time. The actions of the tank, moving and removing the water, meant that fresh air kept circulating, keeping the miners alive. 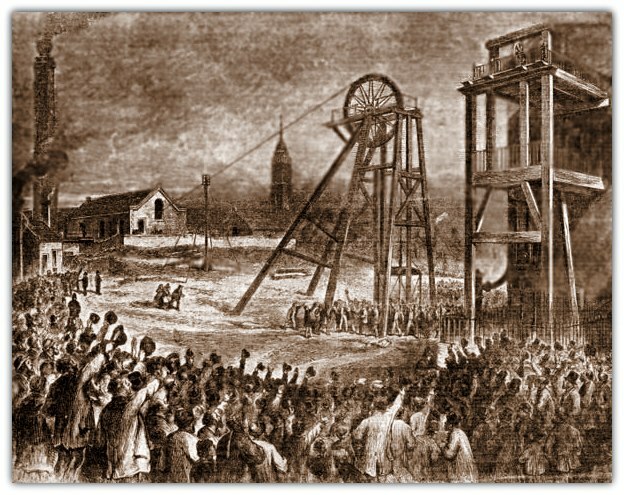 Eventually the miners were reached and rescued on a raft. All but one survived. It is our painful duty to have to record the particulars of the most appalling colliery accident which has ever taken place in this part of Staffordshire. Many of our readers will recollect the explosion at Harts Hill Ironworks, then occupied by Mr. Jeffries, and also the death by fire-damp of several men near the Sampson and Lion, Buckpool, but in neither instance was the number of sufferers so many. The pit is well known as one of the largest on the estate of the Earl of Dudley, and the whole of the extensive plant and machinery is of a kind not to be seen in the mining district of South Staffordshire, being of the very best and most costly description. The safety of the men has been consulted in the highest degree, the appliances being all of the most recent character. Some two years since the water from the Chapel Hill pond burst into the pit, but happily, on that occasion, no one was at work at the time, and no particular damage was sustained, beyond nearly ten days’ pumping to clear it, which having been done, danger of that kind was not expected from any other quarter. Although many surmises have been hazarded as to where the water could have come from on this occasion, it is generally believed to have been a “pocket,” collected in close proximity to the workings, in consequence of the heavy falls of rain which have taken place during the winter, but until the workings are completely cleared of the water, no authentic information can be gathered. Mr. David Plant, one of the chartermasters, was on the spot almost immediately in fact, to use his own words, “he dressed himself as he came along,” and instantly despatched a mounted messenger to Mr. Jeffries, the manager of his Lordship’s mines in this district, who was quickly on the spot. 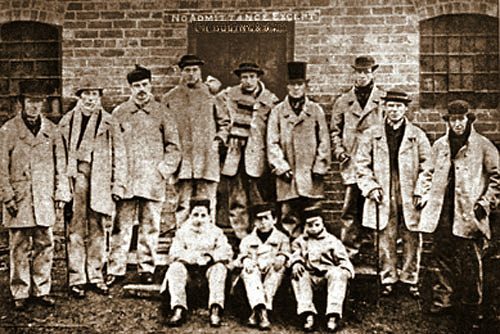 The various agents from the neighbouring collieries were also sent for, and every means were at once put into requisition to rescue the unhappy workmen.